WORLDWIDE: Both rich and poor countries risk undermining emissions targets set at the UN Climate Change Conference in Paris in 2015 due to lack of funding and insufficient policy-making, according to new analysis. 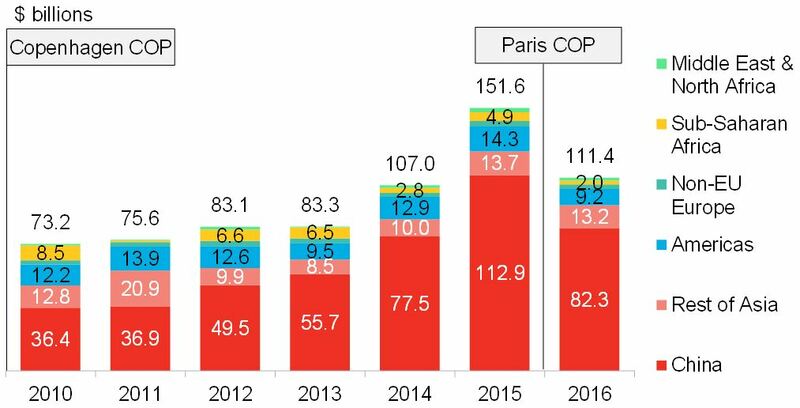 Total new clean energy investment in non-Organisation for Economic Cooperation and Development (OECD) countries fell to $111.4 billion in 2016 — a $40.2 billion (36%) drop from the previous year, Bloomberg New Energy Finance (BNEF) found. In an explainer video ahead of its annual Climatescope analysis, due to be published at the end of the month, BNEF stated this could partly be accounted for by "remarkable cost reductions for solar and wind". Additionally, funds from OECD members — generally wealthier countries — specifically deployed to non-members to support clean energy projects fell from $13.5 billion to $10 billion between 2015 and 2016. The $10 billion figure is just a tenth of the annual sum developed counties pledged to make available to poorer nations by 2020 at the United Nations Climate Change Conference held in Copenhagen in December 2009. Worldwide, only two thirds (67%) of the 71 countries researched in detail by BNEF have introduced feed-in tariffs or auctions to support clean energy projects, while 18% have set domestic greenhouse gas (GHG) emissions reduction policies, the analysts found. Such regulations have proven "critical" to attracting private capital investment in clean energy projects in developing countries, BNEF stated. "The figures highlight the gap between talk and action when it comes to addressing climate and supporting clean energy," said Ethan Zindler head of United States research at BNEF. "Wealthier countries have been slower to ramp investment than might have been expected, given the promises made eight years ago at Copenhagen. "But poorer nations have in many cases not built the policy frameworks needed to build investor confidence and attract clean energy investment," Zindler added. At the United Nations Climate Change Conference held in Copenhagen in December 2009, the world's wealthiest nations pledged to make $100 billion available per year by 2020 to less developed countries to address the impacts of climate change. Six years later, at the UN Climate Change Conference in Paris, nearly 200 countries agreed to reduce emissions in an effort to prevent global temperatures rising above 2C above pre-industrial levels. War-torn Syria is the only nation recognised by the UN not to have signed up to the Paris Agreement, while Donald Trump has repeatedly stated his intention to pull the US out of the agreement when free to do so in 2020. 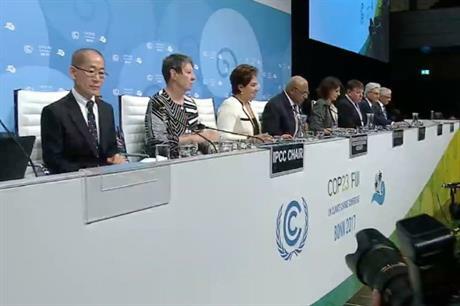 The annual UN Climate Change Conference convened today (6 November) in Bonn, Germany, and is hosted by Fiji.